At the Boston Handmade meeting in August, Arthur and I were talking about how time moves so fast as a potter. Not in that the days go by so fast, but rather we need to look far into the future to plan for ourselves. I always joke that I have plenty of hours in a day, just not enough months in a year. We discussed how painters can sit down and begin and finish a piece in as short as a day. Clothing, jewelry, printing and the like can hold true to that as well. Of course, any artist or crafter needs to be sure the correct materials are on hand and in the necessary amounts before starting a project. You need to mull the idea over a few times to work out the kinks and make sure you have your ideas straight. Then there is the available time to create, which as we know can be very elusive sometimes, but the creation process itself for an individual piece, start to finish, can be relatively short. Potters need to think months in advance, not days or even weeks. Often times when people approach me about a custom piece they are surprised, if not turned off, that they will not have it in two weeks. The ceramic process is much slower than many people realize. I'll use a mug for an example. Forming a mug on a wheel happens fairly quick. Depending on the details and the potter, somewhere between 5-30 minutes is plenty of time to throw the form. Everything slows waaaaay down from here. Clay is a very sensitive material. Drying it too quickly can leave you with cracks and warps in your mug, so potters need to dry work slowly. The mug form needs about a week or so before it's ready to trim and have a handle attached. Once these things are done the mug will need another week or two to dry out completely. Is it a humid New England summer at the time? Better add a week on each round of drying, because that moist air doesn't help our cause. 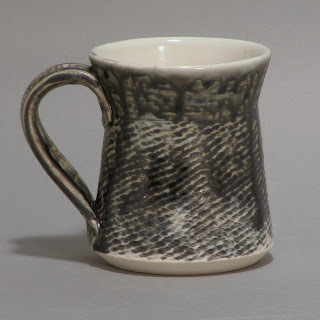 Working with porcelain instead of stoneware or earthenware? Add another week to two again on each portion of drying because it is much more sensitive and is just dying to put a swift end to that mug with a crack from catching the smallest draft. So here we are, with a porcelain mug in the middle of a humid summer, six weeks deep, and it is still unfired, able to be crushed in the palm of your hand. Things pick up a bit from here. For my firing process I usually plan for everything to take about a week. Once I load pieces into a kiln for a bisque firing, which turns the clay into ceramic, it's about two days for it to fire and cool enough to be unloaded. I like to rinse my bisque pieces in the sink after I unload them from the kiln. This clears away dust on the surface that could cause a glaze to crawl and leave bare spots on the surface. Not all potters do this, but it is something I have picked up along the way and feel it's worth the time since a clay studio is a naturally dusty environment. Remember, we're six weeks in here, no point in being hasty. Once rinsed the piece needs to dry out overnight, because the saturated surface is not able to hold the glaze. When dry the piece is glazed and loaded back into the kiln. It'll be another two days for it to fire and cool. Finally we're at the end of the road. About seven weeks in and we finally have something we can sell! Obviously potters work in cycles and we aren't spending this time focusing on one single piece, rather a body of work, but that doesn't mean the time moves any faster. Artists always want to make sure they will safely meet deadlines in time and plan ahead accordingly, but Arthur and I agreed that potters need to look a few pages further into the calendar. It's fall of '10, but in my head we're already stepping into spring '11.